You are about to read one of the most innovative, fascinating, world-transforming summaries of DNA research ever put on the web… Unfortunately it’s not well-documented or linked to other sites backing up the research so you may want to do your own investigation to confirm (or deny) this material. Human DNA acts like a biological version of the Internet — and it is superior to the artificial one in many ways. The latest Russian scientific research directly or indirectly explains phenomena such as clairvoyance, intuition, spontaneous / remote acts of healing, self-healing, affirmation techniques, unusual light/auras around people (namely spiritual masters), the mind’s influence on weather patterns and much more. In addition, there is evidence for a whole new type of medicine in which DNA can be influenced and reprogrammed by words and frequencies — WITHOUT cutting out and replacing single genes. The Russian researchers, however, were convinced that nature was not so dumb. They joined linguists and geneticists in a venture to explore that 90% of “junk DNA.” Their results, findings and conclusions are simply revolutionary! According to their findings, our DNA is not only responsible for the construction of our body, but also serves as a means of data storage and communication. The Russian linguists found that the genetic code — especially in the apparent “useless” 90% — follows the same rules as our human languages. They compared the rules of syntax (the way in which words are put together to form phrases and sentences), semantics (the study of meaning in language forms) and the basic rules of grammar. They found that the alkalines of our DNA follow a regular ‘grammar’, and do have set rules just like our languages. Therefore, human languages did not appear by coincidence, but appear to be a reflection of the inherent patterns in our DNA. The Russian biophysicist and molecular biologist Pjotr Garjajev and his colleagues also explored the vibrational behavior of DNA. In brief, the bottom line was: “Living chromosomes function just like a holographic computer, using endogenous DNA laser radiation.” This means that they managed, for example, to modulate certain frequency patterns (sound) onto a laser-like ray, which then influenced the DNA frequency — and thus altered the genetic information itself. Since the basic structures of DNA-alkaline pairs and language (as explained earlier) are similar, no DNA decoding is necessary. One can simply use words and sentences of the human language! This, too, was experimentally proven. Living DNA substance (in living tissue, not in vitro) will always react to laser beams that have been modulated by language, and even to radio waves, if the proper frequencies (sound) are being used. This scientifically explains why affirmations, hypnosis and the like can have such strong effects on humans and their bodies. It is entirely normal and natural for our DNA to react to language. “Proof” may be too strong a term for this aspect of Gariaev et al.’s research. There could be problems with the design in terms of consciousness science. Namely, the mind of the observer could be affecting the DNA by what they are expecting to see. We already know the observer has a strong effect on DNA from the work of Dr. Glen Rein. He found that negative emotional states caused DNA to contract and positive emotional states caused DNA to unwind, which is a requirement for healing. Gariaev et al. would need to isolate the effect of spoken language on DNA in a completely random, closed system that was not observed by any human consciousness until after multiple trials were taken. This would at least make it more likely that the language itself, and not the observer, is affecting the DNA. 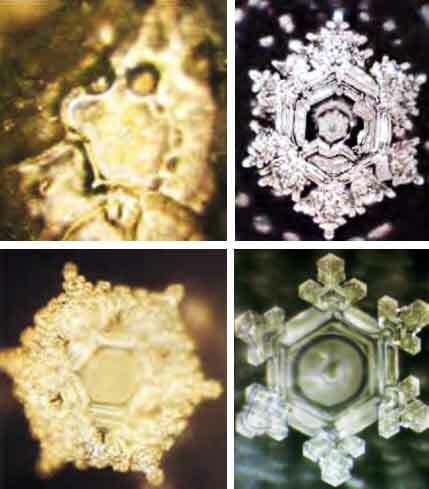 This is the same problem we have with Masaru Emoto’s experiments where water freezes into beautiful crystals in the presence of positive emotional energy and / or creates discordant structures in the presence of negative emotional energy — as featured in “What the Bleep Do We Know” and other sources. We were alerted to these problems in consciousness-science protocol by our interviews with Dr. Cleve Backster, www.primaryperception.com, who has conducted groundbreaking studies in this emerging science for over 40 years now. His work will be featured in our Hollywood film CONVERGENCE. Backster later found out it was very, very difficult to have a truly ‘random’ consciousness effect. The only way he could achieve it with his plant experiments was when no other humans were in the building. He used the most expendable living creature he could think of — the brine shrimp — and tested if the plants would respond to their random death in boiling water. Plants were much more interested in the people in the building than in the random death of a few brine shrimp. Only when the plants were cold and lonely, without any humans to focus on, did they ‘scream’ when the shrimp suddenly died on a random time circuit. They even captured information patterns from a particular DNA molecule and transmitted it into another. The cells were thus reprogrammed with a different genome. They successfully transformed, for example, frog embryos to salamander embryos simply by transmitting the DNA information patterns! All the information needed to build a salamander was transmitted into the frog embryo without any of the side effects or disharmonies we get when cutting out and re-introducing single genes from the DNA. This represents an unbelievable, world-transforming revolution and sensation: by simply applying vibration (sound frequencies) and language, you get cloning effects without using the archaic cutting-out procedure! 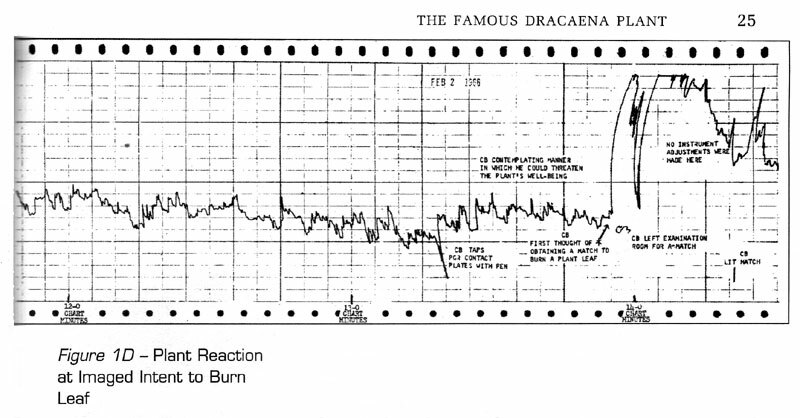 This experiment points to the immense power of wave genetics, which obviously has a greater influence on the formation of organisms than the biochemical processes of alkaline sequences. Esoteric and spiritual teachers have known for ages that our body is programmable by language, words and thought. This has now been scientifically proven and explained. Of course, the frequency has to be correct. And this is why not everyone is equally successful, or can perform feats of consciousness with the same degree of strength. The individual person must work on their inner processes and development in order to establish a conscious communication with DNA. The Russian researchers work on a method that is not dependent on these factors but will ALWAYS work, provided one uses the correct frequency. But the more highly developed an individual’s consciousness is, the less need there is for any type of a device — one can achieve these results by oneself. Science will finally stop laughing at such ideas, and will confirm and explain the results. And it doesn’t end there. The Russian scientists also found out that our DNA can create invisible, structured patterns in the vacuum energy of space, thus producing magnetized wormholes! Wormholes are the microscopic equivalents of the so-called Einstein-Rosen bridges in the vicinity of black holes (left by burned-out stars). These are tunnel connections between entirely different areas in the universe, through which information can be transmitted outside of space and time. 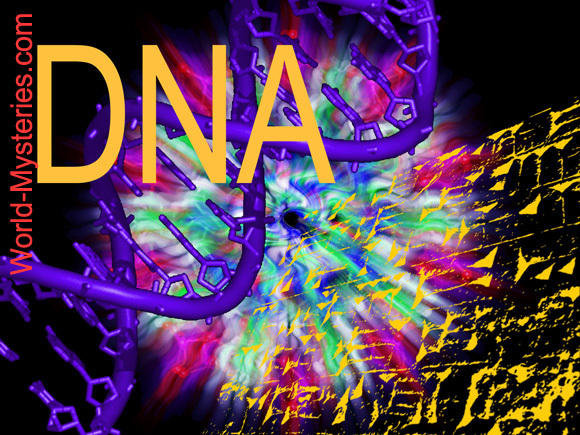 The DNA attracts these bits of information and passes them on to our consciousness. This process of hyper-communication (telepathy, channeling) is most effective in a state of relaxation. Stress, worry or a hyperactive intellect prevent successful hyper-communication — or the information you get will be totally distorted and useless. As an example from nature, when a queen ant is separated from her colony, the remaining worker ants will continue building fervently, according to plan. However, if the queen is killed, all work in the colony stops. No ant will know what to do. Apparently, the queen transmits the “building plans” even when she is far away — via the group consciousness with her subjects. She can be as far away as she wants, as long as she is alive. In humans, hyper-communication is most often encountered when one suddenly gains access to information that is outside one’s knowledge base. Such hyper-communication is then experienced as inspiration or intuition (also in trance channeling). The Italian composer Giuseppe Tartini, for instance, dreamed one night that a devil sat at his bedside, playing the violin. The next morning Tartini was able to note down the piece exactly from memory. He called it the Devil’s Trill Sonata. For years, a 42-year old male nurse dreamed of a situation in which he was hooked up to a kind of CD-ROM of knowledge. Verifiable information from all imaginable fields was then transmitted to him, and he was able to recall it in the morning. There was such a flood of information that it seemed a whole encyclopedia was transmitted at night. The majority of facts were outside his personal knowledge base, and reached technical details of which he knew absolutely nothing. We can assume the identity of this male nurse is revealed in the German version of this book. There are many other examples of this. Mainstream mathematician Srinivasa Ramanujan came up with mathematical formulae in the late 1800s that were so advanced they are still being used in ‘hyperdimensional physics’ calculations. When asked how he accomplished such staggering feats, he said he simply received them from the “Goddess Namakkal” in his dreams. Many child prodigies seem to be tapping into something along these lines — developing incredible abilities at a very young age. Furthermore, the ‘savant’ phenomenon has never been adequately explained, where people with cognitive challenges in most areas have incredible talents in others. This was portrayed in the Dustin Hoffman film “Rain Man”, as one example. Electromagnetic Disruption by Humans: Large Scale “DNA PHANTOM EFFECTS”? Perhaps this is reassuring to read for many, as their equipment malfunctions have nothing to do with them being technically inept; it means they are good at hyper-communication. Computer circuits are highly vulnerable due to the sensitivity of individual electrons traveling through silicon pathways. Light bulbs are also sensitive since their filaments are made from tungsten, which the Russians have discovered is very highly receptive to ‘torsion fields’ — their name for the so-called energy of consciousness that interfaces and sculpts our DNA. You can very seriously mess up a computer with a Russian torsion-field generating device — we damaged a laptop and a desktop computer from conducting these experiments in the past. Now we make sure no computers are up and running in the path of the beam before we power up the device. Richard C. Hoagland reported similar computer problems while taking measurements at the natural ‘vortex area’ of Ed Leedskalnin’s “Coral Castle” in Florida. This is a bizarre collection of huge chunks of coral built into a sort of amusement park. Allegedly Leedskalnin had discovered an anti-gravity effect of some kind that was distinctly tied in with his geographical position on the Earth. In their book Vernetzte Intelligenz, Grazyna Gosar and Franz Bludorf explain these connections precisely and clearly. The authors also quote sources presuming that in earlier times humanity had been just like the animals — very strongly connected to group consciousness. They thereby acted as a group. In order to develop and experience individuality, however, we humans had to forget hyper-communication almost completely. Now that we are fairly stable in our individual consciousness, we can create a new form of group consciousness — namely one in which we attain access to all information via our DNA, without being forced or remotely controlled about what to do with that information. establish contact with other participants in the network. Fifty percent of children become a problem as soon as they go to school, since the system lumps everyone together and demands adjustment. Nonetheless, the individuality of today’s children is so strong that they refuse this adjustment, and resist giving up their idiosyncrasies in the most diverse ways. At the same time, more and more clairvoyant children are being born. Something in those children is striving more towards the group consciousness of the new kind, and it can no longer be suppressed. As a rule, weather patterns are rather difficult for single individuals to influence. However, it may be influenced by group consciousness. (This is nothing new to some indigenous tribes). Weather is strongly influenced by Earth resonance frequencies (Schumann frequencies). However, those same frequencies are also produced in our own brains! When many people synchronize their thinking, or when individuals (spiritual masters, for instance) focus their thoughts in a laser-like fashion, then it is not at all surprising that they can influence the weather. A modern day civilization which develops group consciousness would not experience environmental problems, nor scarcity of energy. If it were to use such mental powers as a unified civilization, it would have control of the energies of its home planet as a natural consequence. The Russian pyramid discoveries we have written about on our Divine Cosmos website prove that ‘torsion fields’ can be harnessed to create positive consciousness effects, miraculous healing phenomena and a noticeable decrease in earthquake and severe weather activity in the vicinity surrounding the pyramid. Ozone holes appear to close up over the pyramids and water underneath the pyramids is purified. Oil well production also increases by 25 percent and the pumped material is cleaner than usual. Check out our free video seminar on DivineCosmos.com for more information. When a great number of people become unified with higher intention as in meditating on peace — potentials of violence also dissolve. [This has been called the ‘Maharishi Effect,’ after the founder of Transcendental Meditation who postulated the idea and then had enough people meditating to adequately test it. Highly substantial reductions in war, crime and aggression were achieved while large groups of people were meditating in the same area. There is another phenomenon linked to DNA and wormholes. Normally, these super-small wormholes are highly unstable, and are maintained only for the tiniest fractions of a second. Under certain conditions, stable wormholes can organize themselves, which then form distinctive ‘vacuum domains’. In these formations, gravity can transform into electricity, for example. Vacuum domains are self-radiant balls of ionized gas that contain considerable amounts of energy. There are regions in Russia where such radiant balls appear quite often. Following the ensuing confusion, the Russians started massive research programs, leading finally to some of the discoveries mentioned above. Many people know vacuum domains as shiny balls in the sky. The attentive look at them in wonder and ask themselves, what they could be. I thought once: “Hello up there. If you happen to be a UFO, fly in a triangle.” Suddenly, the light balls moved in a triangle. Or they shot across the sky like ice hockey pucks: they accelerated from zero to crazy speeds while sliding silently across the sky. One is left gawking by this. I have, as many others too, thought them to be UFOs. Friendly ones, apparently, as they flew in triangles just to please me. Now, the Russians found — in the regions where vacuum domains often appear — orbs that sometimes fly as balls of light, from the ground upwards into the sky. These balls can be guided by thought. Earlier generations that experienced such hyper-communication and visible vacuum domains were convinced that an angel had appeared before them. We can never be too sure about what forms of consciousness we will access when using hyper-communication. Although they have not had scientific proof for the actual existence of these higher forms of consciousness, people having had such experiences do NOT all suffer from hallucinations. We have simply made another giant step towards understanding our reality. Thoughtful suggestions – I learned a lot from the information – Does someone know where my company might acquire a sample a form document to type on ? For the extensive comments I’ve written about what I call The Gulf Coast Cuckoos, visit http://www.phantomsandmonsters.wetpaint.com, and search the site using that name as the keyword. Mad scientists on the payroll of the U. S. Government have been breeding “lab rat” babies since the end of World War II right there in southeast Louisiana, on the Gulf Coast of Mississippi and Alabama, and along the panhandle of Florida. I am one of those lab rat babies; five of us were put in Skinner boxes for two weeks of sensory deprivation (we were cleaned and fed, but got no cuddling or lullabies) at Touro Infirmary in New Orleans. Many “lab rat” babies were placed for adoption when their usefulness was ended. The adoptive parents had no idea that not only were they getting damaged goods, but children who would have a “special quirkiness” for the rest of their lives. The quirkiness: The fear that someone was following them, yet if they tried to escape, they would be forced to return home. Nice article, but I would like to know how scientists claiming our brains reached maximum capacity, actually measure human brains maximum capacity? Actually, this experimentation reached its peak after WWII with sensory deprivation, MK Ultra experimentation with drugs and suggestion. The goal was the same, find the amazing abilities humans have but don’t ordinarily express. They key here, obviously, is the periodic incursions of our local magnetic field which forces the gases and crystal axes to compress in front of the magnetic incursion. As the magnetic wave passes over the objects that were compressed, they decompress and resemble the gas giants. We, amazingly still here on planet E, have experienced a magnetic wave incursion (compression), sudden decompression (expansion) and perhaps this has happened several times as Sol is still here since any magnetic wave strong enough to reach the surface of Sol would lead to a nova. Note: we experimented with magnetism so magnetism is not the key, it is the compression of all gasses, realignment of crystal axes as in water, etc. that allows this ephemeral glance at what humans are composed of. Ephemeral is the key here. The sting from the tale.gets respondent whats woe to some is life to others. My mind is expansive and I have dreamed about this universe full of high potential. Now Virtual Reality is becoming the Mirror World of our present realm. I have taught this for years and when I pick up a RPG controller I think of my Monadic Self living through this expression of DNA as broadcast from the Tree of Life or the Godly Expression. Mind rides the expressions of reality and inculcate the feeling manifesting before our very senses. Soon, we will have an output device that will utilize a DNA computerized application. See Nano-technology.